WindSync’s highly creative approach in concert and outreach performances is driven by the Quintet’s mission to inspire audiences of all ages through innovative, interactive chamber music. The ensemble is a pioneer in unconventional performance practices which are designed to further the members’ original musical concepts. Playing exclusively from memory, WindSync’s dramatic musical interpretations and stage presence immediately engage the audience, whose experience is further enhanced through the performers’ creative use of costumes, masks and choreography. Recognized for its adventurous programming, WindSync was selected by Concert Artists Guild for the 2012 Sylvia Ann Hewlett Adventurous Artist Prize, and also received numerous performance prizes from the CAG competition, including engagements at the Chautauqua Institution, the Regina A. Quick Center for the Arts at St. Bonaventure University, Music For Youth (Southport, CT) and the ensemble’s New York debut at Weill Recital Hall at Carnegie Hall in fall 2013. Strongly committed to educational enrichment and promoting arts engagement, WindSync’s featured educational appearances in 2012-13 include the Seattle Symphony Orchestra and the Rockport Chamber Music Festival, among many others. WindSync has been presented by Music for Autism in five cities across the United States, with performances for audiences with special needs, and is also developing new projects dedicated to teaching appreciation of differences through music education in schools. In 2011-12, the group was selected as Ensemble in Residence for the Da Camera of Houston Young Artist Program. 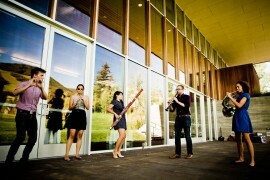 WindSync also holds the position of Ensemble in Residence with the Grand Teton Music Festival, presenting programs inspired by ‘Music in Nature,’ and will return for a second season in summer 2013.